Laguna Seca – MotoGP victory at the U.S. makes Marc Marquez has collected three titles in his debut season. With great potential you had, Valentino Rossi said Marc could be the best of all time. Marquez not only touched the finish line in pole position in the race at Laguna Seca, Monday (22/07/2013) pm dawn. He did it with a great action when overtaking Valentino Rossi in corkscrew twists. 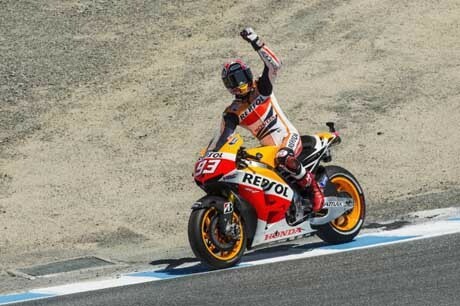 Centipede podium at Laguna Seca Marquez became the third victory in the debut season. Rider 20 years before it was finished champions in Austin and the Sachsenring circuit. “He’s got all the potential to be a (rider) of all time, or better than me, or to win more than me,” said Rossi flattering Marquez. “He’s got great talent, great skill, and is still very young. But it is too early to tell right now because the road is still long. But he has a 100% chance to make it happen,” said Rossi in Crash. Than when he was undergoing his debut in the 500cc class, Rossi said Marquez has much better capabilities. The Spanish rider was very rarely makes mistakes, which makes him very rarely fell from his mount. 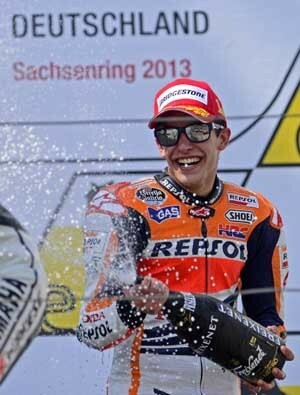 In fact, except when an accident in Italy, Marquez always completed the race on the podium. Currently he is on top of the standings with 163 points. “I was very fast in the 500 class in 2000, but I made ​​a lot of mistakes and fall in the first two races, and perhaps for that reason I failed to become champion. So Marc same as me, but already-upgraded – new model!” Rossi continued. MotoGP world champion Jorge Lorenzo has withdrawn from Sunday’s German grand prix and needs another operation on his left shoulder after he crashed in practice at the Sachsenring on Friday. The Spanish Yamaha rider, who is second in this year’s standings behind compatriot Dani Pedrosa of Honda after seven of 18 races, was running quickest in the afternoon session but lost control at turn 10 and landed heavily on his left shoulder. “The Mallorcan was taken to the Clinica Mobile, where examinations indicated that the eight screws in his shoulder were in tact but that the titanium plate itself had been bent by the impact,” organisers said on the MotoGP website (www.motogp.com). The 26-year-old had the screws and plate inserted two weeks ago after sustaining a broken collarbone in practice for the Assen grand prix and despite the injury flew back to Netherlands after surgeryin Barcelona and finished fifth. After the setback in Germany, he now faces a race to be fit in time for the U.S. grand prix at Laguna Seca next weekend. “I have decided to go home and recover after today’s crash at Sachsenring,” Lorenzo said on the Yamaha Factory Racing website (www.yamahamotogp.com).